Thank you dear Raivis /"Lazy Frank" for taking up our little 2018-analysis of this very famous Gambit within an already famous Gambit-line. 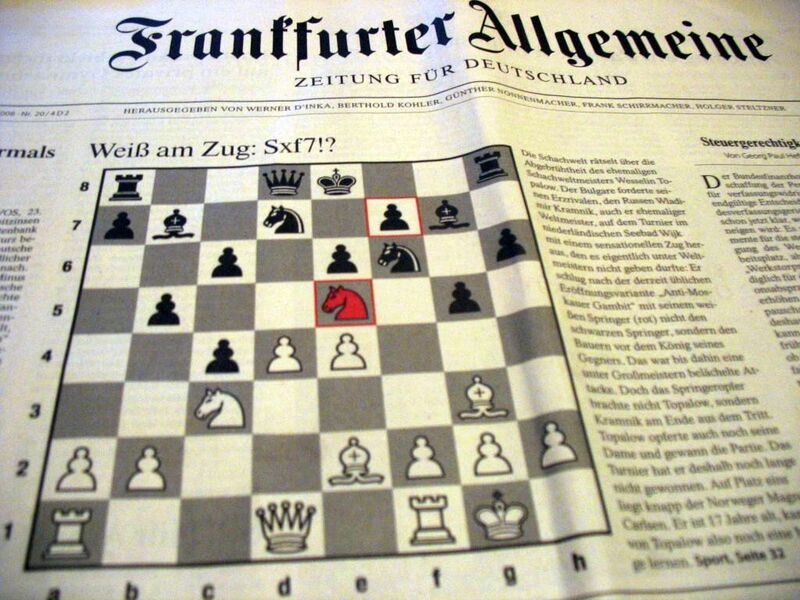 It was first publicly shown to a wider audience by Topalov vs. Kramnik at the Corus tournament 10 years back (though first shown by Romanian Miron Nacu at the ICCF chess-olympiad 2007) and made it the main-topic on the front-page of newspapers! - most likely the last chess-related topic having that "honour". The Gambit² is considered drawn or even slightly disadvantageous for White (score<50%), so let's see whether a '18-look can offer new insights in it. Seems you put me in position where i have no choice! Can you write down notation? > Can you write down notation? Not doing so was already my first trick! Very interesting, thanks Dan! - will definitely have a deep look. Thanks Daniel! Much appreciated your hard work. 1. d4 d5 2. c4 c6 3. Nf3 Nf6 4. Nc3 e6 5. Bg5 h6 6. Bh4 dxc4 7. e4 g5 8. I checked Nacu's original 2007-idea of 13. f4? !, but this simply doesn't keep enough attacking-pressure on Black's position. P.S. I like the original idea of Qc2! > P.S. I like the original idea of Qc2! In the 13.f4-line (after 13...b4) or here? As 13. Qc2 it can still transpose. Ok, now i take a bit time! Take how long you want and enjoy analysis! Oh, and in the meantime, you liked "the original idea of Qc2!" in general or in a certain line (13.f4!?) which White didn't play? Yes, it is the key idea in a lot upcoming lines! Others are a4, knight-moves and Bh5/Bg4. Yeah, those were Topa's greatest days, bulldozing through the first round of San Luis 2005... just Danailov was said to have a very nervous behaviour in the audience. Ok, here i will need a longer time... but at least i'm relieved, that you also consider this the "main position". Stay tuned. Take your time! That is all what we (people) actually have! give White a decent play) 17. Bxh5 Bh6 18. Qg4 Raf8 19. h4 c5 20. hxg5 Bg7 21. g6 N7f6! 22. Bh4 Qxd6 * White is simply dead-lost!, with the only reasonable "improvements"
absolutely no attacking-potential at all). In each case i may take now a pretty long time, position is VERY critical. I could have even lived with 19...Rhg8! ?, but 19...c5! with 21...N7f6 is just a massive improvement which leaves 19. h4 very questionable. If we lead to 21... N7f6, i would say: Dead win. Also thought so, but the strange thing is that nearly every corr-game played 19. h4 but none got replied 19...c5, so either there is some refutation i/we don't know or those guys all had more luck than sanity. Btw., a little IP-address analysis indicated that your connection belongs to a Mr. Alexei Shirov... please explain! As i know Alexey live in (also represent) Spain. Friend of mine long time ago played few games against Shirov onto Riga's central park 'Vērmaņdārzs' benches. -thinking without that 16. a4-idea- rehabilitates Nacu's original 13. f4 as well. I don't think there is something more, but let me examine sidelines too. No, nothing more left, shame, i lead to typical black pawn setup. I sadly have to take there as everything else would lose on the spot. Actually i'm same a bit surprised, but it's only move that avoid the draw. We both lead to unknown zone. Nice! Wished Uly would have a little of that spirit (he choses always the moves who avoids the wins)! Think with 19. b3!? White also an interesting draw/option in hand... what was your draw-option here instead of Rhg8, can you give a line? I didn't overlook b3 option, like you would have played axb5. So, room for post-mortem analyse. Till here it was Grischuk-Liren (WCC 2018/Berlin), which continued 20...Bc6, where Black after 21. f4 should play 21...h5 instead of Liren's 21...gxf4?, which loses on the spot to 22. Bh4+ +/-. Even against 21...h5 i think White has some nice attacking-ideas, but there may be better 21th-moves currently not known to me. Way more challenging is 20...Ba6 (21. f4 b4! 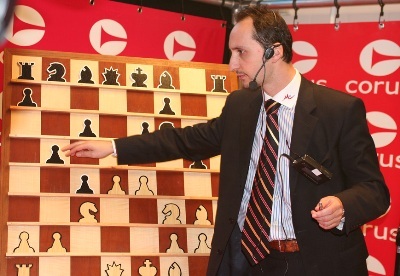 ), which AlphaGrischuk himself showed in the press-conference after that game. I think i found an interesting resource there, but eval was still very modest and more or less some (deep-hidding) wonder would be needed for White to win. 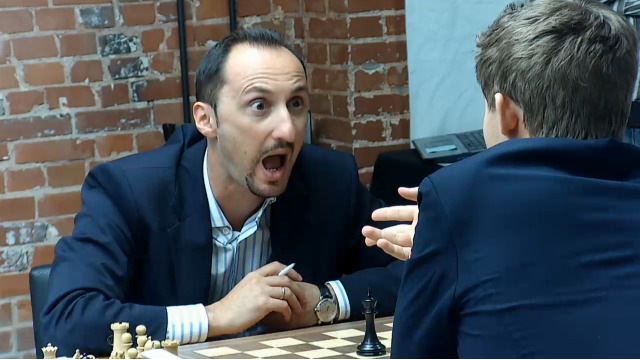 20...b4 may obviously have the same spirit in case White still has to play 21. f4. 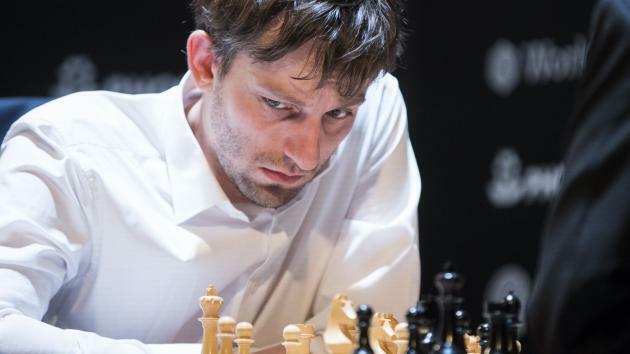 In each case it is just VERY impressive how Grischuk prepared for this OTB-game... easily outcalculating every corr-game played till now as 16. Bg4 is simply not good at all! Quickly checked yesterday evening, but there seems to be absolutely nothing left to [re]set fire on board - White has no threats but a billion way to draw... Rgh8 damps out perfectly every Qc2/Qg4-idea, gives [drawing-]threats on g2 as well - most likely the best move at Black's disposal. Let's see! You played your last card (f4) ... now is black time. To feel more comfortable i think i need you give back some material, right?